When it comes to hair products, I am quite set in my ways. Not that I won't try something out mind, just I don't have the patience to deal with hair that tends to favour a scarecrow when it goes belly up. Having naturally wavy hair that it's very prone to frizz come rain or shine. 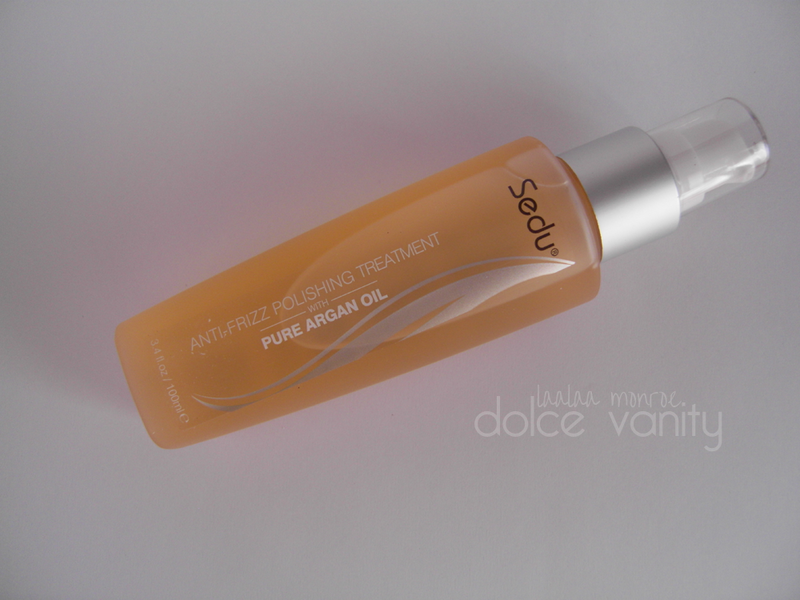 When I was asked if I wanted to try Sedu Anti-Frizz Polishing Treatment I took awhile to accept this offer as I've tried anti frizz products before that didn't work for me. Reading that a prominent ingredient is Moroccan Argan oil I decided to give it a shot. I've read about morroccan oil several times before being such a great oil for hair. When I was my hair have limited my heat intake when possible so I allow my hair to air dry and will straighten my hair a day or two after the wash - I just find it works so much better for me. • Final condition and I rinse with cool water. • While my hair is damp, I use a wide tooth comb to get out or prevent knots and to also get rid of any dead hair that's come out during my washing process. • Comb thoroughly and leave to air dry. Once my hair is dry it's manageable and it's far from greasy but it's very moisturised and lightweight -which I love. Even when my hair is natural it's easy for me to manage and when it's straight it flows and its light - bonus. It's rare for me to put two different oils into my hair as it seemed at first for me it would just make my hair greasy but a little goes a long way with the anti-frizz polishing treatment the pump that it has to distribute the product is easy to use - well of course it's a pump you say - but have you ever come across some that are stubbornly hard to even push and when you do...too much product comes out ... or the ones that are too easy and it still seems to pump out more than you need. Where with this pump it seems to just pump the right amount and if need be you may need a second pump and that's all. Doesn't Matter What Type Of Hair You Have - This Is For You.